An evolved, pleasant wine, this medium dark-ruby colored notes of plums, cherries, damp earth, and hints of mushrooms and wood. Straightforward and medium-bodied. The harvest is manual. The sorting is done in the vineyard and in the winery. The vinification is carried out in temperature-controlled tanks and aging is done in oak barrels (60% new) for 16 to 18 months. Oenologist Denis Dubourdieu is the advisor for this wine. The color is dark. The intense nose is marked by red fruits. On the palate, the wine is full-bodied and ample, drinkable in the early years while it has the ability to age gracefully. The average annual production is about 200,000 bottles/year. The AOC Pauillac is located on the left bank of the Gironde and brings exceptional climatic and geological conditions, which enables it to produce great wines. Capital of the Medoc wine, the port town of Pauillac gave its name to the appellation. The AOC can boast three wines in the first five Grands Crus 1855: Lafite Rothschild, Latour and Mouton Rothschild. Its 1200 hectares of vineyards, Pauillac annually produces 54,000 hl of red wines. Note that Mouton-Rothschild also produces a white wine. 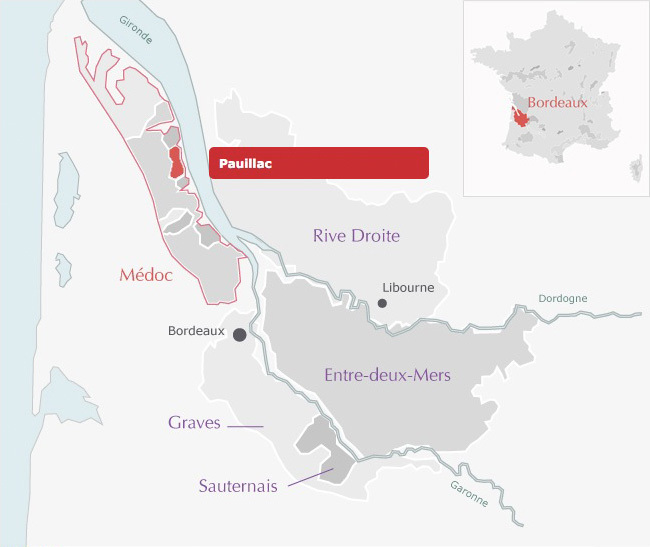 Pauillac is a gem from Medoc, 18 wines Crus Classés can be found in Pauillac that represent 85% of its production. The land is planted with Cabernet Sauvignon blended with Merlot and to a lesser extent Petit Verdot and Malbec. Experts agree that the Cabernet Sauvignon has here found its terroir. Pauillac mouth is full, rich, creamy, pleasantly tannic and full-bodied. The aging of these wines is exceptional as they have a great aging potential of 15 to 25 years or more for some wines. Over the years, the round tannins and aromas open. They lose their aggressiveness to become thin and delicate, while retaining their power.